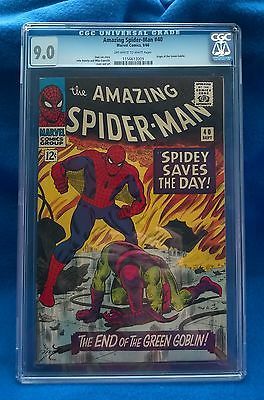 This Auction is for an original Amazing Spider-man #40 CGC graded book 9.0 VF/NM condition, with off-white/white pages. INTERNATIONAL BIDDERS MUST USE PAYPAL. Please contact me for worldwide shipping rates before buying if not listed. First Class Mail can't be insured, so I am not offering it as an option. International packages will be sent priority mail with insurance.